PC Tail shielded contacts provide a cost effective packag­ing solution for limited space applications where connec­tors are attached to printed circuit boards. High reliability is assured with factory pre-assembled contacts and stan­dardized termination to the board. PC Tail contacts are available for MIL-DTL-38999 Series III. 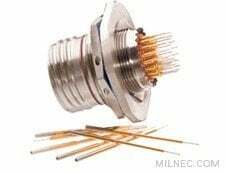 For improved performance we recommend Milnec TX00 (D38999/20) and TX07 (D38999/24) style receptacles, which are fully compatible will all MIL-DTL-38999 Series III stye connectors.